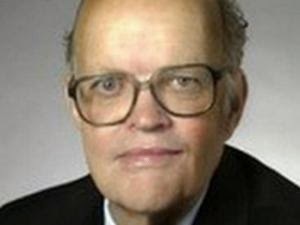 Gaze into the eyes of this racist Duke professor to have nightmares for a week. Duke political science professor, Jerry Hough disagreed with the editorial titled "How Racism Doomed Baltimore." The article focused on the notion that poverty and isolation of the African-American community in Baltimore were major causes of recent riots after Freddie Gray's death. In the comments section, Hough said, "blacks get awful editorials like this that tell them to feel sorry for themselves. So, where are the editorials that say racism doomed Asian-Americans? They did not feel sorry for themselves, but worked doubly hard." Reading Prof. Hough's bio on Duke's site, I notice this: "[His next book, George Washington and the formation of the American Political System, 1774-1799] focuses on the political philosophy of the Founding Fathers and the way that they solved the religions [sic] conflicts and the collective action problems of the revolution and the Constitutional Convention. Hough also writes on the implications for current Iraq." I can't wait to see if it's proofed as well as that page. Update: James Loewen takes Hough to task for not knowing enough about race relations to even know how completely ignorant he is about race relations. Nice.